Flexible substances that can withstand high temperatures are much sought after for various industrial and engineering applications. 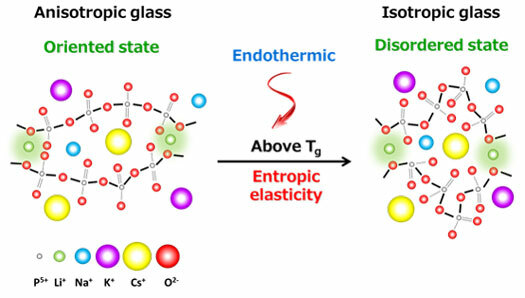 Types of glass made from oxides are hard at room temperature and fracture easily, but scientists at Tokyo Institute of Technology and Asahi Glass Co. Ltd in Yokohama have uncovered a certain kind of oxide glass – so-called mixed alkali metaphosphate glass – that behaves quite differently when it is stretched from a supercooled liquid state. Seiji Inaba, Setsuro Ito and Hideo Hosono study oxide glasses that possess structures similar to those of organic rubbers, consisting of soft, long, straight chain molecules. The team discovered that metaphosphate glass expands and contracts rather like rubber at a temperature close to the ‘glass transition temperature’ (the point at which glass changes state from a super-cooled liquid to a solid). The researchers stretched a supercooled, metaphosphate glass made from mixed alkali metals - lithium, sodium, potassium, cesium, and phosphorus oxide. Upon heating and elongation, the straight chain molecules in the glass became highly orientated, and the glass itself became rubber-like. When the researchers heated the glass still further, it contracted in size by several tens of percent, before returning to its original unordered molecular state. This property is known as ‘entropic elasticity’, and this is the first time that a type of glass has been shown to display it. Rubber-like oxide glass such as this could be considered for applications in high temperature, oxidizing environments in which organic polymer rubber could not cope. The results of the group’s research will appear in the online edition of the magazine Nature Materials, published on December 2, 2014. Inaba and his team conducted experiments with a mixed alkali metal metaphosphate glass with the chemical composition Li0.25Na0.25K0.25Cs0.25PO3. This oxide glass is isotropic and is hard and easily fractured at room temperature, in the same way as normal glass. 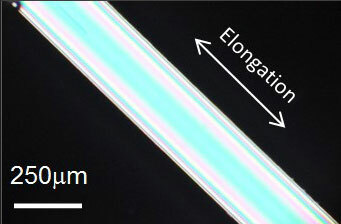 However, when it is heated to the vicinity of the glass transition point Tg and then cooled in a stretched state, the glass becomes anisotropic – its physical properties become directionally dependent - due to the orientation of the straight chains.